The Palace of Versailles in France is a historical site. But it's now moving into the future. The vast Versailles complex requires tons of staff who must move around the grounds to carry out daily tasks. This moving about will now be done in the cleanest possible way as French automaker Renault provided the Palace with 23 pure electric vehicles, which will be supported by the install of 30 charging stations (yes, the Palace of Versailles and the grounds that surround it are huge). Those chargers were installed with respect to the "architectural integrity of the chateau and grounds, i.e. under the lower windows of the Grande Ecurie stables, in the Trianon domain, at Marly and in the Orangery gardens." 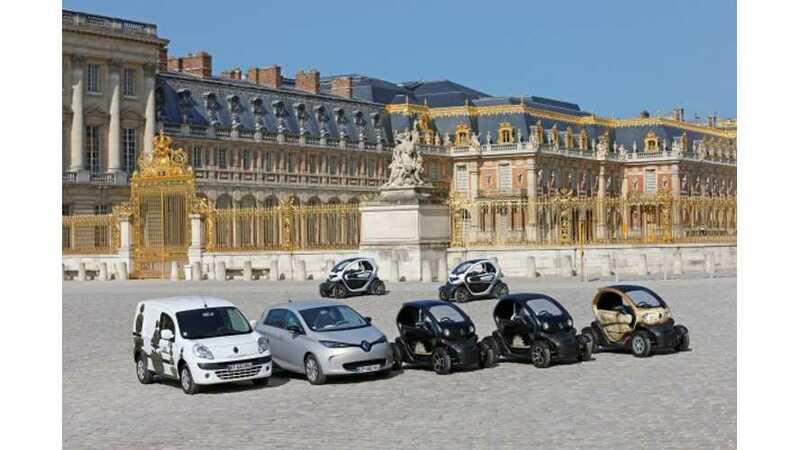 Renault whipped out most its fleet of electrics for the Palace. The grounds are now home to ZOEs, Twizys, a couple different versions of Kangoos. We see no Fluence Z.E.s included though. As for them Twizys, most will be used be security who need to zip here and there throw tight places to quickly respond to any issues that pop up. The ZOEs are the general travel vehicles and the Kangoos do work duty.